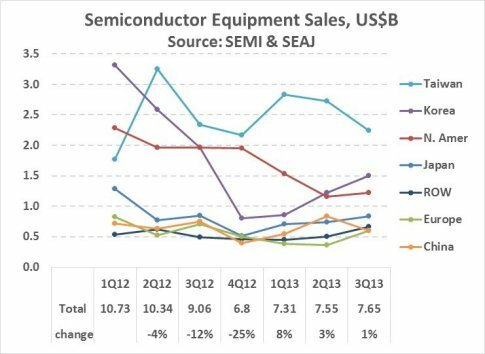 December 20, 2013 -- Global semiconductor manufacturing equipment sales have increased each of the last three quarters after dropping significantly in the second half of 2012, based on data from Semiconductor Equipment and Materials International (SEMI) and Semiconductor Equipment Association of Japan (SEAJ). Much of the volatility is in sales to Korea, which dropped 76% from 1Q12 to 4Q12 and then rebounded 87% from 4Q12 to 3Q13. Semiconductor equipment sales in Taiwan have varied by quarter, but have generally been close to $2.5 billion a quarter. Sales in North America were fairly steady in 2012, but declined in the first two quarters of 2013 before picking up slightly in 3Q13. Taiwan, South Korea and North America (primarily the U.S.) account for about two-thirds of total semiconductor equipment sales. China has not yet emerged as a major market for semiconductor equipment, remaining about the same size as Europe and ROW (rest of world). Japan was the largest market for semiconductor equipment for many years, most recently in 2008, but has declined to about 10% of the market. SEMI’s December 2013 forecast for semiconductor equipment billings called for a 13% drop in 2013 to $32.0 billion from $36.9 billion in 2012. As shown above the 2013 decline is due to a weak first half, with the market increasing in the second half. SEMI expects growth to pick up 23% in 2014 and 2% in 2015. The chart below shows SEMI’s forecast and historical billings back to 2000. The year-to-year trends are very volatile, with declines of close to 50% in several years and recoveries of up to four times the prior year. 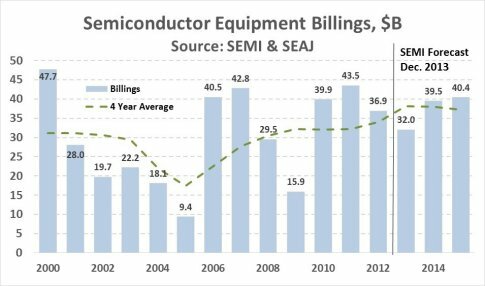 A four year average of semiconductor equipment billings shows a more consistent trend. Over-investment in 2000 kept the average close to $30 billion through 2003. Under-investment dragged the average down below $20 billion in 2005. The average recovered to $30 billion in 2008 after strong investment in 2006 and 2007. The average will reach about $38 billion in 2013 and should remain close to that number based on SEMI’s forecast through 2015. How does semiconductor equipment spending compare to the market for semiconductor devices? 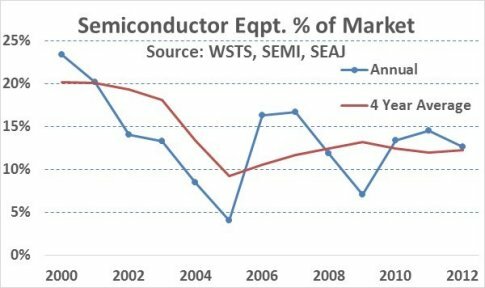 The chart below shows the ratio of semiconductor equipment spending (from SEMI and SEAJ) to the semiconductor device market (from WSTS). The year-to-year data is very volatile, but again the four-year-average shows a more consistent trend. The four-year-average ratio dropped from 20% in 2000 to below 10% in 2005. For the last six years, the four-year-average has been in a narrow range of 12% to 13%. 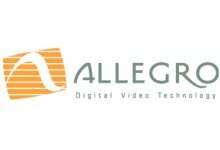 The industry has matured and growth has slowed, allowing for better communication among semiconductor equipment companies, semiconductor companies and semiconductor users. The increased use of wafer foundries has enabled a better balance of capacity. Rather than individual semiconductor companies scrambling to increase capacity to meet demand or idling capacity as demand falls, the foundries can shift capacity among customers as needed. Increasing use of specialized semiconductors versus commodity semiconductors. 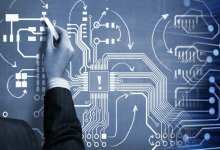 Many electronics applications depend on semiconductors designed specifically for the application or customer. 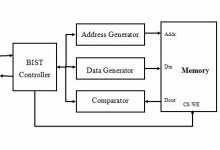 This leads to better planning between the electronics manufacturers and the semiconductor suppliers. 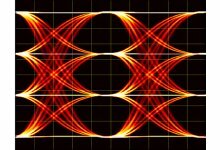 Exponential rise in cost of wafer fabs. 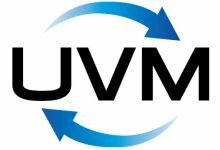 As the cost of a new wafer fab has ballooned from less than $100 million in the 1980s to multiple billions of dollars today, companies can no longer afford to build fabs on speculation of higher market growth or increased market share. Companies must base fab decisions on reasonable growth plans and may depend on wafer foundries for incremental additional capacity. 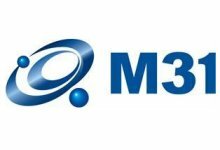 Fill out this form for contacting a Semiconductor Intelligence representative.